It is spring here on the Olympic Peninsula. New birds are chirping in the forest, and the seasonal fish are starting to migrate into the area. It's an exciting time in the forest. Just today I counted a few dozen trilliums hiding in the sea of ferns. Amazing! Hiking season is officially here, now that the snow is melting from the mountains. I can't help reflecting back to all the mistakes I've made on the trail in the past, even more so how many right choices as well. So many great adventures! How does one process them all? 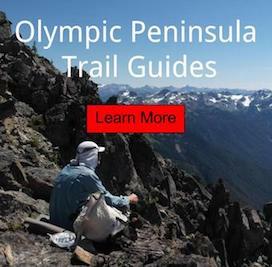 For me it takes a few months or even years to truly appreciate doing something unique, of let's say a 10 day trek across the Olympic Mountains. Maybe I should focus on being more in the moment? Maybe it takes going in the city and being stuck in traffic for hours, to truly appreciate it all. I don't really have all the answers, but I do know how nice it is to breathe fresh air.